Torotrak is to begin a programme of visits to pan-European vehicle manufacturers and Tier One suppliers to conduct a series of test drives. ndependent on-engine test results verify simulation predictions that a V-Charge variable drive mechanical supercharger enables more ambitious levels of engine downsizing. Compared to a current 1.5L GTDI engine producing an impressive 240 Nm torque – a 1-litre GTDI engine of the same EcoBoost family outperformed the 1.5L-litre version when fitted with a V-Charge unit. The tests were carried out by the University of Bath Powertrain and Vehicle Research Centre (PVRC), using a Ford 1.0L EcoBoost engine, in a part-government funded programme. The 1-litre engine with V-Charge delivered 250 Nm torque, corresponding to a BMEP (Brake Mean Effective Pressure) of 31 bar. Transient performance was also significantly improved compared to the original 1-litre GTDI engine, which in production form is fitted with a single fixed geometry turbocharger. The superior transient response of the V-Charge equipped engine, particularly at lower engine speeds, results in significantly improved driveability even compared to the 1.5-litre unit. A Ford Focus (above) powered by a 1-litre EcoBoost engine fitted with the V-Charge system will be participating in the ‘ride and drive’ programme at the Aachen Colloquium Automobile and Engine Technology congress, which takes place in Germany from 10th – 12th October. The event is the largest of its kind in Europe and this year more than 65 companies will be exhibiting to approaching 2,000 participants. 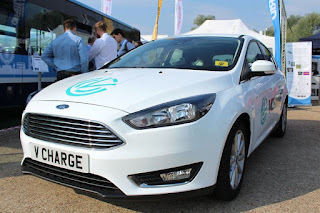 Following the Aachen Colloquium, the V-Charge demonstrator vehicle will begin a series of test drives with global vehicle manufacturers and Tier One automotive suppliers in Germany, France, Belgium and the UK. Torotrak hopes that by taking this initiative it can convince automakers to implement further trials and eventually exchanges meaningful contracts. Torotrak believes that both 48V electrical systems and positive displacement Roots type superchargers will struggle to meet the demands of future ‘second generation’ downsized engines. V-Charge has been designed to deliver continuous air power capability of up to 17kW achieving the first-stage boosting requirements on even the most aggressively downsized engines. V-Charge uses a traditional centrifugal compressor, instead of a positive displacement Roots type blower, reducing power consumption, improving efficiency and requiring less package space. Packaging is also simplified by the quiet operation of V-Charge, eliminating the need for soundproofing. Test results for NVH show the sound pressure level of a V-Charge installation is up to 98.5% lower than a Roots compressor system. Because V-Charge is driven by a Torotrak continuously variable transmission (CVT) with a wide ratio spread of 10:1, the compressor speed can be set independently of engine speed to deliver the right amount of air flow for every condition, without the need for a wasteful bypass. The CVT can change from minimum to maximum ratio in less than 400ms, and the actuation power during this rapid ratio change is less than 20W. Although tested on a gasoline application V-Charge could, according to Dunne, achieve similar gains on a downsized diesel engine and bring additional emissions benefits: “The availability of air on demand will allow air-fuel ratios to be more fully optimised to minimise NOx and particulate output, especially during transient events,” he concluded. Is this the same engine?